Our Original Butter Popcorn with every kernel completely coated in delicious golden cheddar. That great cheddar taste with no yellow fingers. Need we say more? A little less Cheese than our Cheddar for those who like to keep things light. White Cheddar popcorn with the great taste of dill pickle added. Just like it sounds – less the potato. 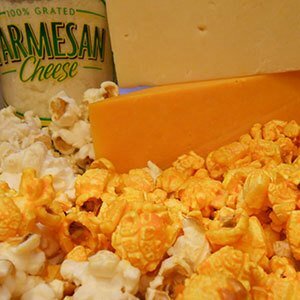 Sour Cream, onion, bacon, cheddar cheese, ranch, and chives coating every kernel of our Original Butter Popcorn. A new childhood favorite. White cheddar, yellow cheddar, and Parmesan cheese with just a hint of garlic. White Cheddar Popcorn with Parmesan cheese and Garlic. Cheddar cheese popcorn blended with bacon BBQ seasoning. Cheddar cheese popcorn tossed with real bacon. White Cheddar Popcorn tossed with Parmesan cheese, sea salt, and black pepper. White Cheddar Popcorn with savory ranch. White Cheddar with vinegar and salt. Cheddar cheese and Jalapenos, medium hot. Our Cheddar Cheese Popcorn tossed with chili and a hint of lime. White cheddar, ranch, and Jalapeno, just a little heat. The same great taste of the hot Buffalo wings – Tabasco. Want to tone it down a little – just like the wings, mix it with the Ranch Popcorn. Our hottest popcorn! Our famous cheese popcorn tossed with the flavors of red chili peppers found in Sriracha.